What if U.S. Politics worked like Israel's System? I've written before about how Israel's political institutions shape the political outcomes. It is really easy to focus on particular politicians and personalities, and ignore the structural factors behind election results and political culture more broadly. This article, on the juvenile tendencies of Israeli voters, is a good example of the former. But Israel's system has two features that push voters away from the center and towards the fringes. It creates incentives for fringe parties. This is bad, because parties are how you convert public preferences into policy. Too many parties is bad for sustainable, governable democracy. First, in the Israeli system you only need a bit over 3.5% of the popular vote to sit in Knesset. Second, the whole country is a single district. Each vote is effectively for all 120 members of the Knesset. What this means is that a mid-level political entrepreneur with a decent following has every incentive to leave the party and start his own party. With his own party he can extract more for his core constituents by joining a coalition with the ruling party (and threatening to leave when he doesn't get his way) than working within then party. Further, this fringe party's very success builds the core constituency, which only cares about certain specific issues. It might be useful to illustrate how this would play out in the U.S. if our system worked that way. Look at the clip from the poll above. It is a recent poll of potential presidential candidates. The poll found 60% of Democratic voters supported Hillary Clinton for the nomination, 13% supported Joe Biden, 12% supported Elizabeth Warren, and 5% supported Bernie Sanders. On the Republican side 19% supported Jeb Bush, 18% supported Scott Walker, 10% supported Mike Huckabee, 9% supported Ben Carson, 7% supported Rand Paul, 6% supported Chris Christie, and 5% supported Marco Rubio. For our thought experiment, let’s translate 3% points of support into 2 seats in the “Washington Knesset” (and we’ll round up). To become Prime Minister, the candidate needs at least 61 seats supporting him or her. Hillary starts off in a pretty good position with 40 seats supporting her directly (more than Likud got in Israel’s elections). Warren, Biden, and Sanders would have about 21 seats combined, so there you go - a majority and premiership. But Hillary has a good relationship with Wall Street and will need to work with them to govern. Whenever Hillary threatens to do something Socialist Bernie Sanders doesn’t like, he can threaten to leave the government, effectively bringing it down. To avoid having her government held up by Bernie Sanders, she might look at others she could work with. Chris Christie would also have about four seats in the Knesset and he is not hard-right on social issues and might be willing to join a Hillary-led government. Of course there is a cost, he’d want a major portfolio with which to provide benefits for his core constituency - maybe Defense for the prestige and lucrative contracts. And, Hillary would need to treat him well, otherwise he’d bolt the coalition. Of course Hillary would also need to keep Warren and Biden happy, which might be hard with economic conservative Christie in the government. Hillary’s obvious choice would be a grand coalition with Jeb. Both are relatively moderate and could probably work together. But together they’d only represent 55 votes, they’d still need to keep Biden or Warren in the government, where each of the coalition partners would exercise outsize power. Every major decision would require painstaking compromises. Besides, Hillary’s voters wanted her in power, not Jeb. An alliance with him would hurt her with her base of support. Scott Walker wouldn’t be an alternative. Since one of his primary programs is anti-labor, it is unlikely pro-labor Biden or Warren (to say nothing of Socialist Bernie Sanders) would be wiling to join him in the government. Now, here is where things get very interesting. Some of the smaller parties might see an opportunity. Mike Huckabee would have about 7 seats. Maybe, in exchange for a key portfolio and regular support to his constituency (say large social programs run through churches) he’d be a fairly docile member of the coalition. Maybe Marco Rubio with 4 seats, and primarily interested in foreign affairs could be partner - in exchange for a major national security portfolio. But that would pull the government in different directions on national security issues. Finally, there is Dr. Ben Carson with 6 votes. In the American system as it currently works, a candidate like Carson is weeded out in primaries (remember when Herman Cain was the GOP front-runner?) But in the Israeli system, a mercurial celebrity can run, garner votes and sit as an independent party in the legislature and reap benefits as the major parties attempt to woo him. Pretty ugly scenarios? Welcome to Israeli politics. Netanyahu has less than half the seats he needs to govern. Even with his two key allies he only has 44 seats (and these allies need care and feeding in their own right.) Even a grand coalition with the second largest party would only give him 54 votes - not enough. The most likely scenario is a government with his core allies, the two religious parties, and one of the new centrist parties. But this won’t be easy. The centrist parties tend to be secular and don’t like the religious parties. It is easy to blame Netanyahu for his lack of vision, his pandering or his particular policies (and it should be emphasized - he has his flaws!) It is also easy to say that Israel's democracy is failing, that Israeli voters have turned extremist. But look at the system and how it shapes incentives and outcomes. No political system is perfect. The U.S. has its share of gridlock and constituencies that benefit disproportionately from government policies. But, at its the core the separation of powers means there are a great many things the president can do without congress, but at the same time congress is empowered to check the president. In most parliamentary democracies the Prime Minister also has a very broad scope of things he or she can do. But in Israel, because of the political fragmentation, the Prime Minister is constrained at nearly every turn. As an experienced Israeli foreign policy hand observed, “the prime minister must strike a deal with the minister of defense every morning." With Russian president Vladimir Putin playing an outsized role on the world-stage, any book discussing "the end of Russia" is quite the intellectual outlier. But Berman, vice president of the American Foreign Policy Council and an experienced Russia hand, looks to the field of demographics (too often ignored by students of international affairs) to observe that Russia's population is on the precipice of a rapid decline and that its current economic strength rests on weak foundations. Berman has done an enormous service in pointing out this deep trend in international affairs. Russian birthrates are well below replacement levels; life expectancy has declined, and Russians are rapidly fleeing the corruption and lack of opportunity in their homeland by emigrating to the West. Russia's depopulation is particularly problematic in the Far East where a resurgent China covets the vast resources of this enormous region. As Russians leave Asia, Moscow will be hard-pressed to enforce its authority in the face of China's growing presence. Meanwhile, in European Russia, Muslims are the fastest growing segment of the population and, thanks in great part to Russia's heavy-handed counterterror policies, are isolated from broader Russian society and turning towards radical Islam. Berman suggests some nightmare scenarios were these trends to continue, but more importantly, he raises the fundamental question of what will become of Russia when Russians are a minority in their own country. 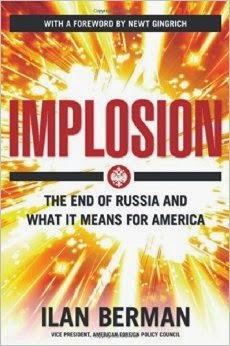 While the Russians have proven adept at exploiting their Soviet-era arms, nuclear, and space industries as well as the country's vast energy reserves to woo and pressure other states, the author also shows how other Soviet legacies, such as a decayed social and physical infrastructure, are rapidly hollowing Russian power. After sketching out these trends, Berman prudently avoids making predictions, but a more in-depth analysis would be welcome. Are there no opportunities for the United States and the West in Russia's coming implosion? And how can Washington best position itself to take advantage of them? Finally, Russia is not the only Eurasian country facing a demographic collapse: How will aging Europe and Japan factor into Russia's future? First, it is worth noting some key stuff that Berman got dead on - most notably the fundamental ricketiness of the Russia economy. With oil prices low, their economy is in free fall. The increased aggression of a Russia seeking to hold on to its place on the world stage is another key point. But beyond that, I've been interested in demographics since reading Ben Wattenberg's The Birth Dearth I've been fascinated by demographics. Not the short-term growth and decline of towns and cities (although that is interesting) or the changing ethnic make-up of a region - no, I'm interested in the big stuff. Where is a nation - or all of humanity - going? Most of the developed world is heading into population decline (Japan is already there) and birth-rates across the world have slowed dramatically. On the whole, this is for the good. For centuries population growth was slow because disease took such a heavy toll. The number of people who served childhood was small and then there were innumerable opportunities to die. Infections and injuries were easy to acquire and tough to survive. Even modest improvements in health care and sanitation lead to explosive and unsustainable population growth. But leveling off is one thing, what about outright decline. Does youth provide a certain energy and push for innovation that might be lacking in an older society? Intuitively, this seems right, although it may not be true. The U.S. with modest population growth is a world center for innovation. Japan is the world leader in population decline, and their economy is in the doldrums, but that hasn't prevented them from inventing and creating. On the other hand, population growth leaders like Pakistan and Nigeria are hardly centers of innovation and creativity. If there is a happy medium, it is probably the United States which maintains a just below-replacement level birthrate augmented by relatively generous immigration policies. Through immigration the United States regularly welcomes the most capable and resourceful people from the rest of the world. This may not be a planned strategy to maintain American strategic advantages, but it sure works out that way. With Europe heading towards decline will that lead to the slow end of Western Civilization - that amazing thing that started with the Greeks and has been an engine of liberty and wisdom for thousands of years? Or do these ideas have a power and resonance that extends beyond any ethnic group? I loved my time at St. John's College in Annapolis and hate to think that these profound ideas will fall into the dustbin, ancient texts of little relevance. Maybe we'll keep out own planet tidy, visit around as tourists, and focus on self-acualization. It is a vision of humanity growing up.